You may have heard of Hyaluronic Acid and wondered why it’s being promoted as an essential ingredient for skincare products. We’re all about education here at Beyond Skin, so let us give you the lowdown on this fabulous skin-drink. Hyaluronic acid is a glycosaminoglycan, which is polysaccharide (essentially a very large sugar!). It is naturally occurring in connective tissue throughout our bodies, with 50% of it being found in our skin. It is one of the major components of our extracellular matrix (the framework in which our skin cells sit) and it also has an important role in retaining moisture, as one molecule alone can hold up to 1000 times its own weight in water, putting hyaluronic acid centre stage for skincare. So what can it do for my skin? Youthful skin maintains its plump, luminous appearance due to its high content of water. One of the main reasons we love hyaluronic acid is due to its unique capacity to hold onto water. In a sense, hyaluronic acid acts like a sponge holding vast amounts of water in the skin, effectively plumping out the skin and by doing so it can reduce the appearance of fine lines and wrinkles, as well as improving the skin’s hydration and texture of the skin. But do we need hyaluronic acid in our skincare? Hyaluronic acid is a great moisturising ingredient that is suitable for all skin types and is perfect for providing that extra hydration hit that skin desperately needs during the cold winter months! As for hyaluronic acid as an anti-ageing ingredient, it’s great at helping to reduce the appearance of fine lines and wrinkles but it’s more of a temporary solution to wrinkles rather than a permanent fix. So how do I shop for it? There is no ‘ideal’ concentration of hyaluronic acid, but the higher up it features on an ingredient list, the more of it will be found in the product and so it’s more likely it will have the desired effect. When looking for your next hyaluronic acid-containing product, check the ingredients list for hyaluronic acid, sodium hyaluronate, hydrolysed hyaluronic acid and sodium acetyl hyaluronate as different brands use different ones or a combination of many, but they all work in a very similar way. To get the benefits of hyaluronic acid, invest in a product that you leave on your skin, such as a moisturiser or serum, as opposed to a wash-off product like a cleanser. 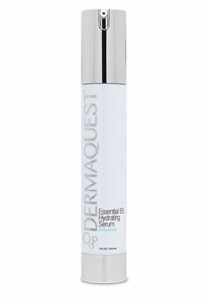 Our favourite Hyaluronic Acid based product is Hydrating B5 Serum by Dermaquest. An essential for all skin types providing instant hydration to skin in a lightweight, easy to wear serum. If you’d like to learn more about Hyaluronic Acid and how you can incorporate it into your skincare regime then why not book a consultation with one of our skincare experts by calling 02890 333858 today. This entry was tagged dermaquest, hyaluronic acid, skincare. Bookmark the permalink. ← The Big Launch Party!